Although 231 had been working the Mark 4 sets on the Dublin-Cork run for several weeks, I was still momentarily puzzled when I spotted the down Cork approaching Mallow back in February 2018. ‘What’s this?’ I thought, expecting something green. I always like it when I get something unexpected, yet if I had known this was approaching, I’d probably have positioned myself on the far platform. Photos exposed digitally using my FujiFilm XT1 with 18-135mm zoom. I made some exposure and contrast adjustments to this wide angle view to allow for greater detail and more balanced exposure on the shadow-side of the train. 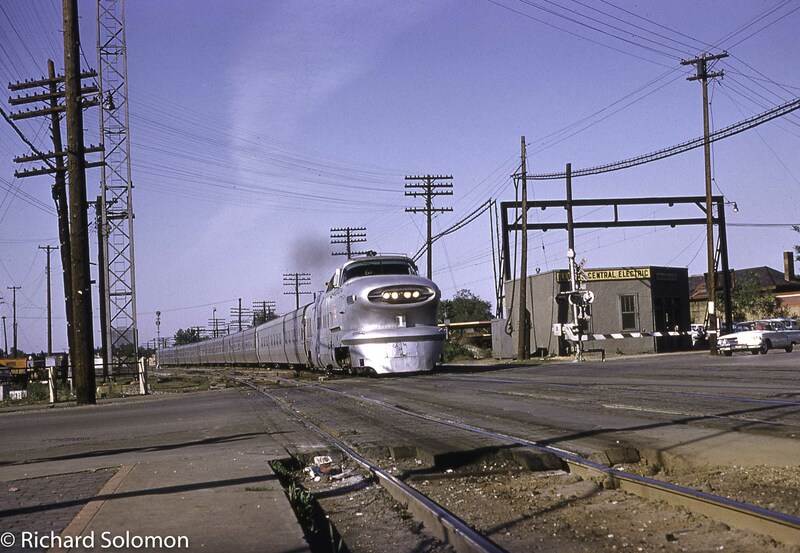 Brian Solomon Slide Presentation: General Motors Diesel-Electric Locomotives in North America. On Monday, 8 October 2018 at 8pm (20.00), I’ll be giving a slide presentation to the Irish Railway Record Society in Cork on General Motors Diesel-Electric Locomotives in North America. 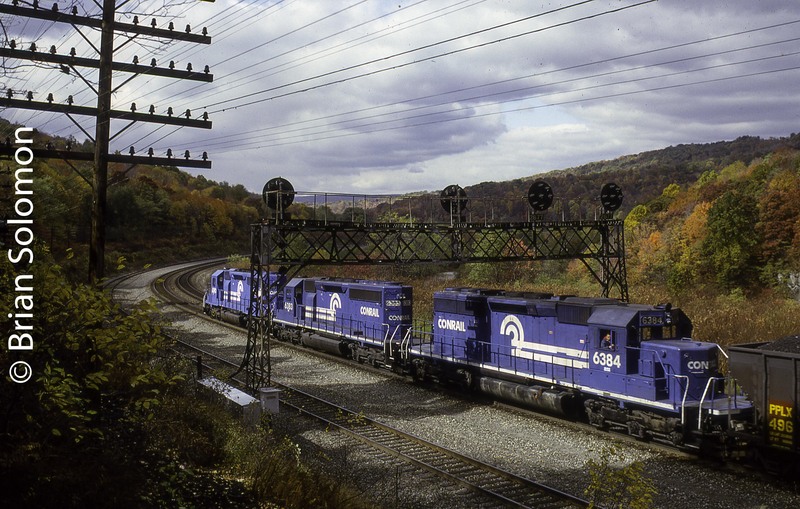 Conrail SD40-2s work as helpers on a loaded coal train at Mineral Point, Pennsylvania in October 1992. Exposed on Kodachrome 25 colour slide film. 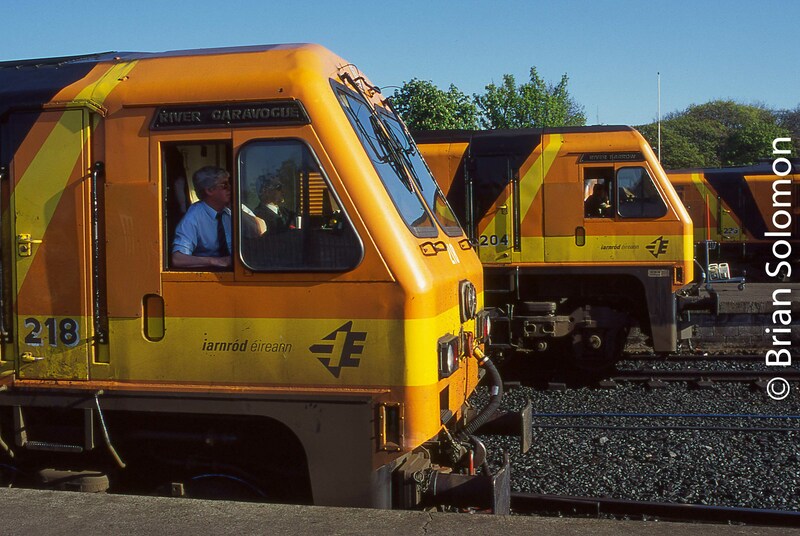 I will show a wide variety of colour slides detailing General Motors Electro-Motive Division diesels at work. This will cover numerous models on many different railroads, and feature some of my most dramatic locomotive photography. Vintage EMD six-motor diesels lead New England Central 611 at Millers Falls, Massachusetts in 15 November 2017. Exposed on Fujichrome Provia 100F using a Canon EOS 3. 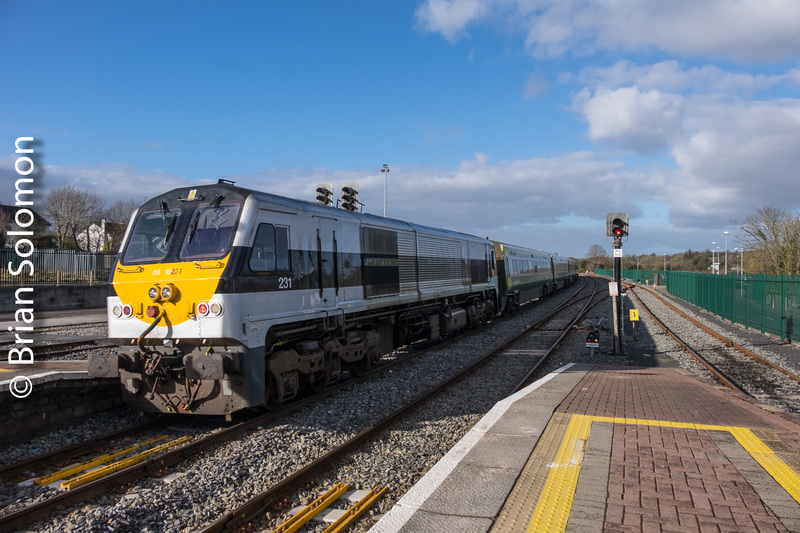 Irish Rail 218—Sunny Days and Cloudy Days. 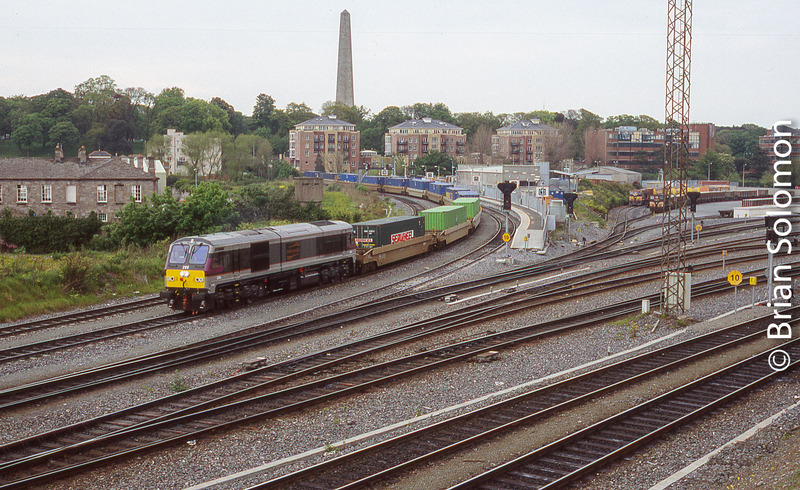 Old Irish Rail 218 is a versatile machine as shown in the three views exposed over the years near Heuston Station. 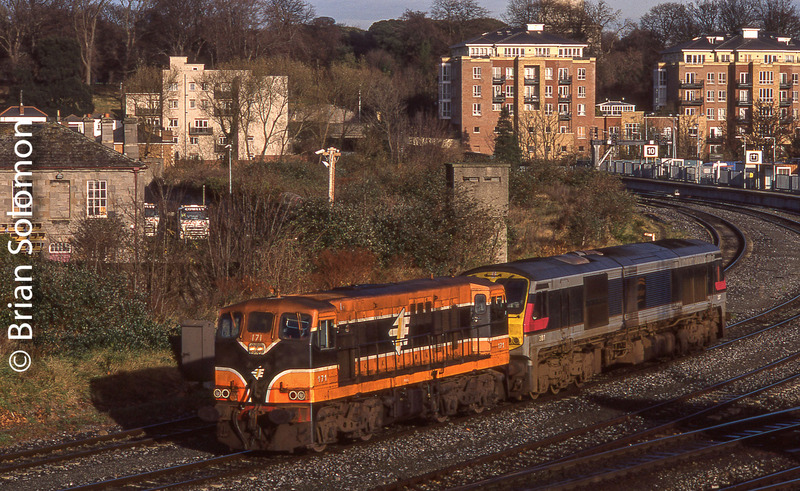 In recent years, 218 has often worked the Dublin-Cork Mark 4 passenger sets, as well as liner freights and performed the occasion stint in permanent way service. 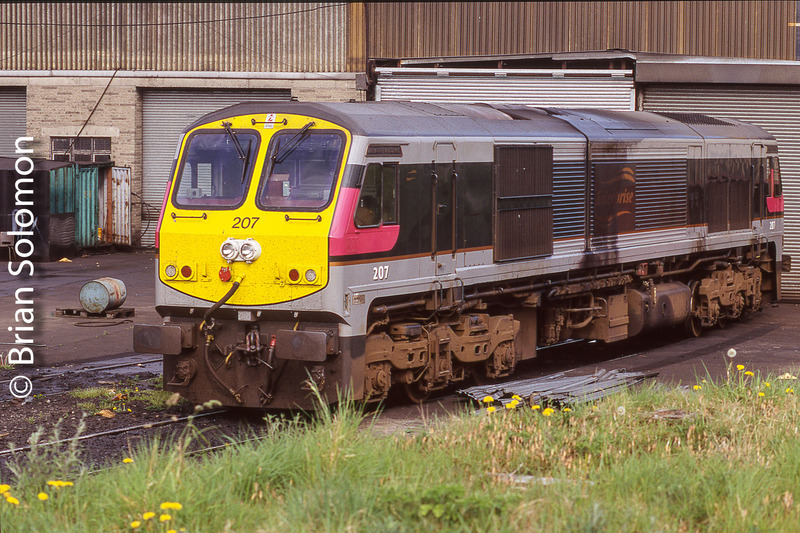 Irish 218 is ready to head down road at Heuston Station in Dublin in summer 2000. It’s along side 204 and 233. Exposed on Fujichrome Sensia II (100 ISO) using a Nikon N90S. 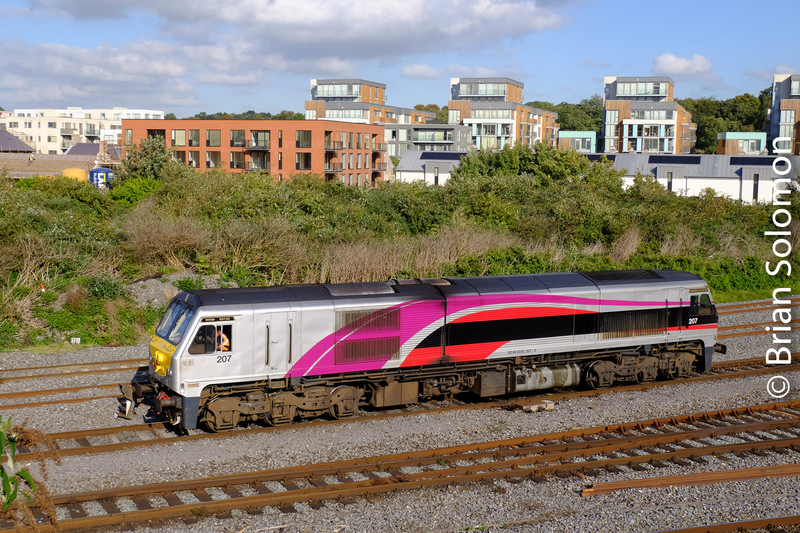 On 11 September 2016—15 years after the infamous day—Irish Rail 218 works a Mark 4 set toward Cork. 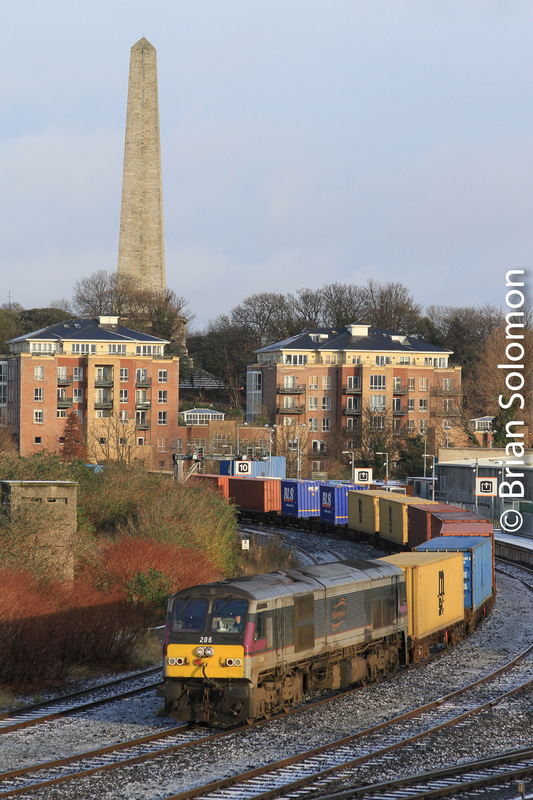 This view is from my often utilized location at Islandbridge Junction. Exposed as a RAW file with my FujiFilm XT1 and adjusted for contrast in Lightroom. Cloudy days yield opportunities too! 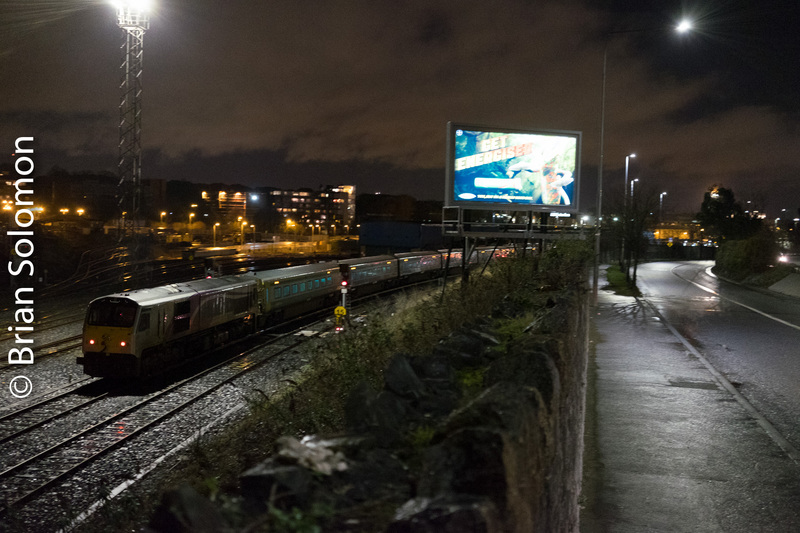 On 27 February 2018 Irish Rail 218— now displaying its modified long number—leads a panel train into Dublin’s Phoenix Park tunnel. The next day snow blanketed Dublin and surrounding areas causing travel chaos. Of the 201 class locomotives, 218 is another machine that ranks with numerous photos in my collection. 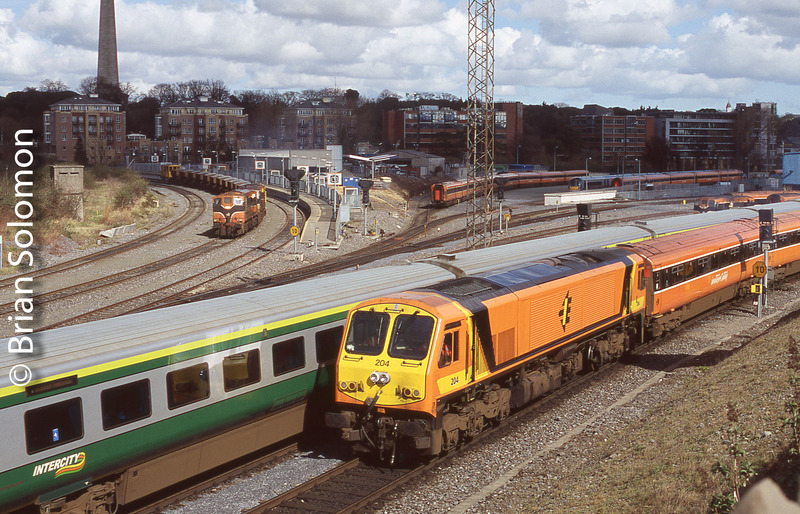 Six Vintage 201 photos: Spring with Irish Rail 213! 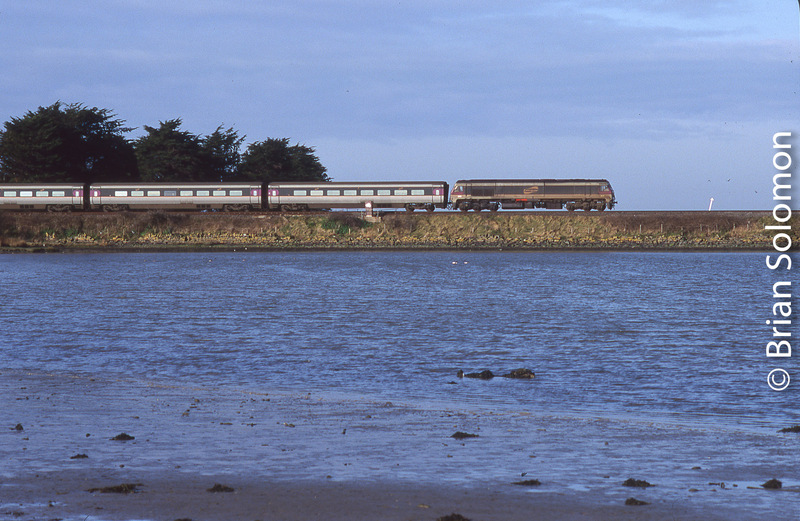 Years past, I made many colourful photos of Irish Rail 213 River Moy on bright Spring days. One of my first encounters was in May 1998 at Carlow. I’d arrived by bus (Shhh!!) 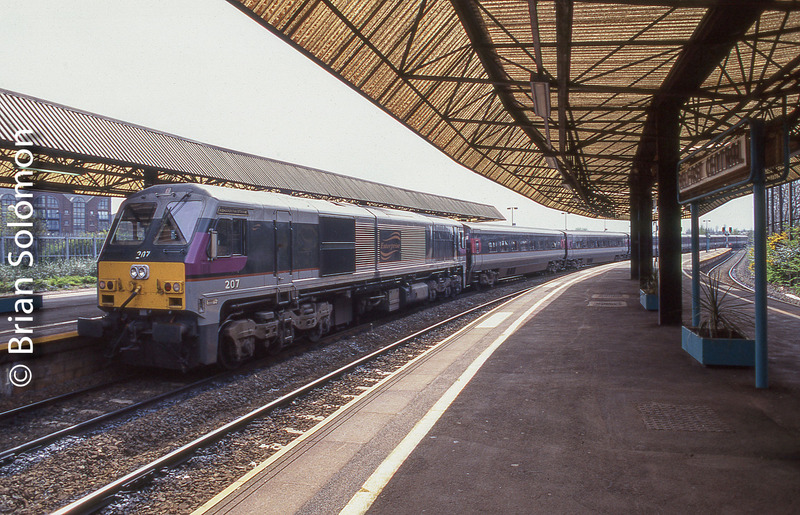 and made photos of the down train (Dublin to Waterford) at Carlow station using my Nikon F3T loaded with Fujichrome Sensia 100. View through the fence from the road using a 135mm lens. 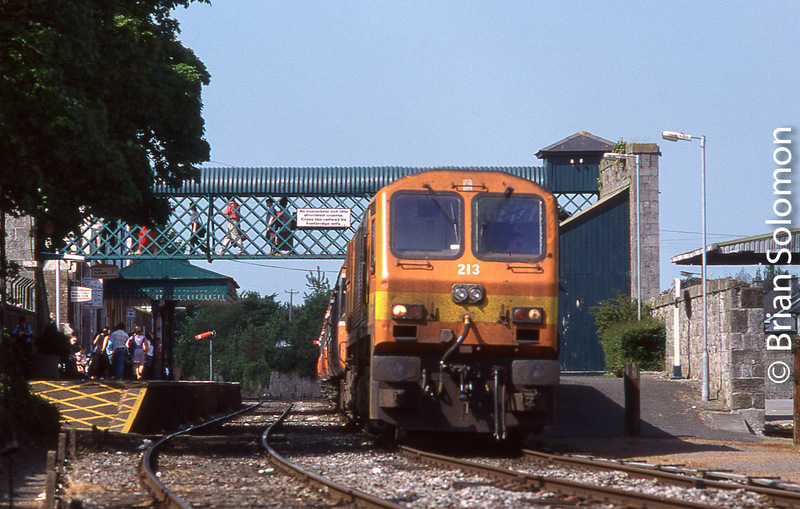 213 side-on as it approaches the down starting signal at Carlow in May 1998. 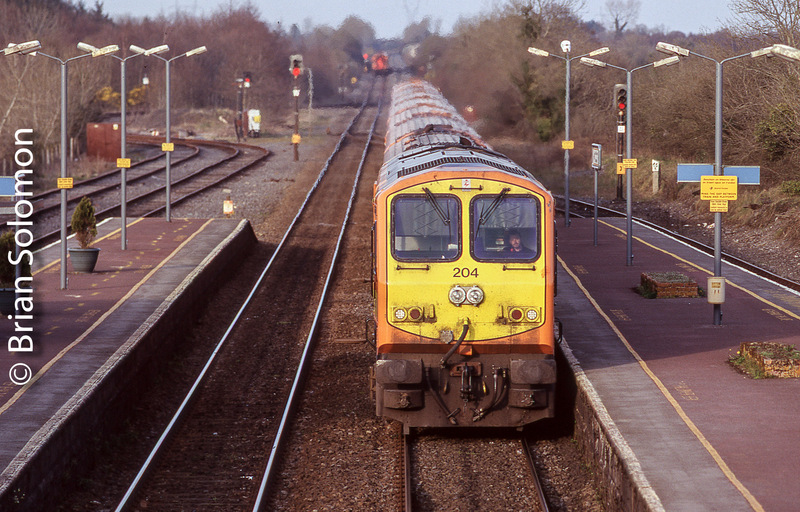 Seven years later, in the Spring of 2005, I was keen to catch 213 on the move, since this was the first Irish Rail class 201 to wear the revised orange livery with bright yellow front end. I saw this as a big improvement over the original 201 livery. 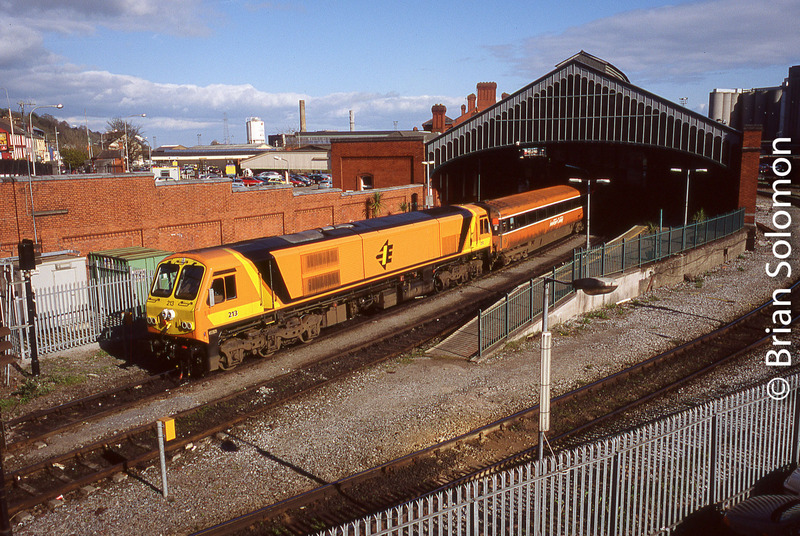 On 8 April 2005, I photographed 213 in fresh paint with my Contax G2 and 28mm lens on Velvia slide film. 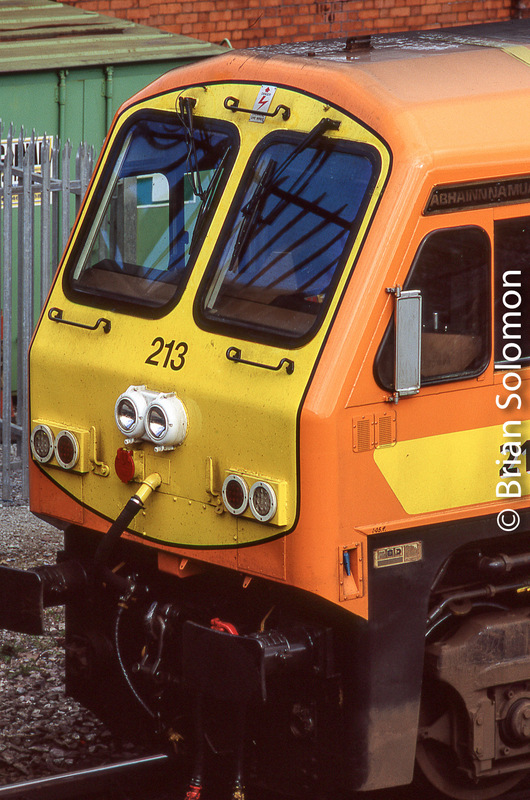 Close up of 213 at Cork’s Kent Station using my Nikon N90S with telephoto lens and Sensia 100 film. 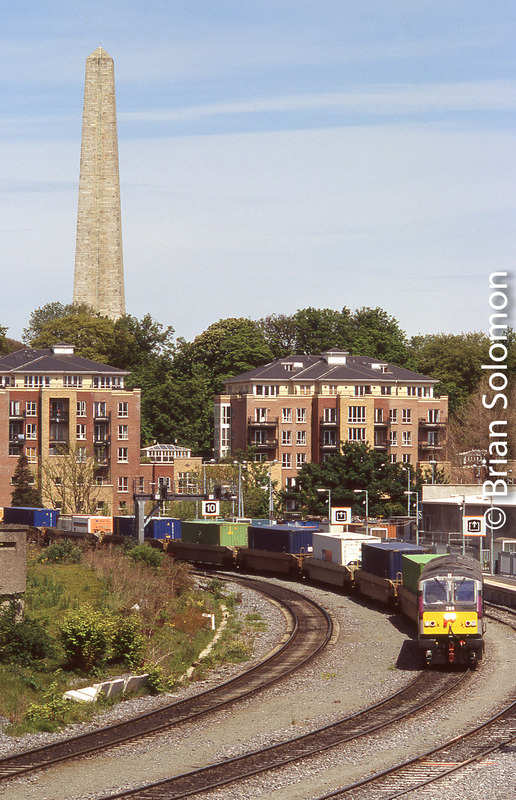 A month later on 8 May 2005, I made this view of 213 light engine at Heuston Station in Dublin. Anyone need a cheap shoe? And because it fits the theme, I’ve also included a view from April 2006, of 213 descending Ballybrophy-bank racing toward Dublin. 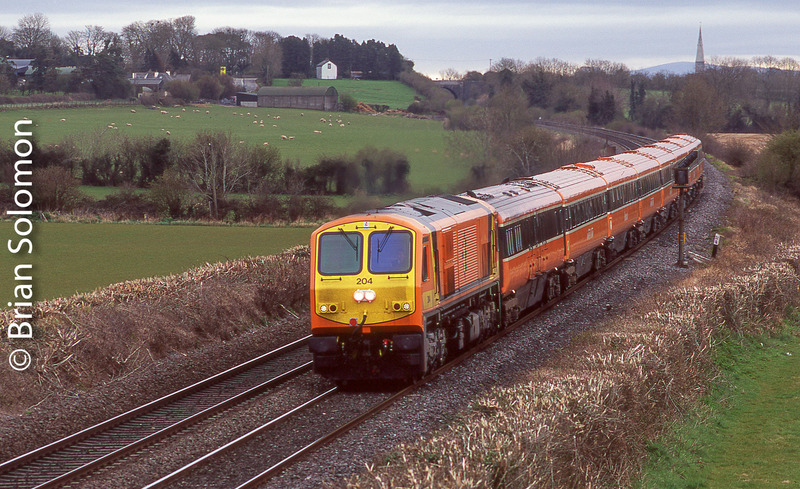 It was on the evening of 17 April 2006 when I caught 213 with Mark3 carriages on the up-Cork passing milepost 62 1/2. 213 hasn’t turned a wheel in many a Spring now. It waits its turn in the sun in a deadline at Inchicore. 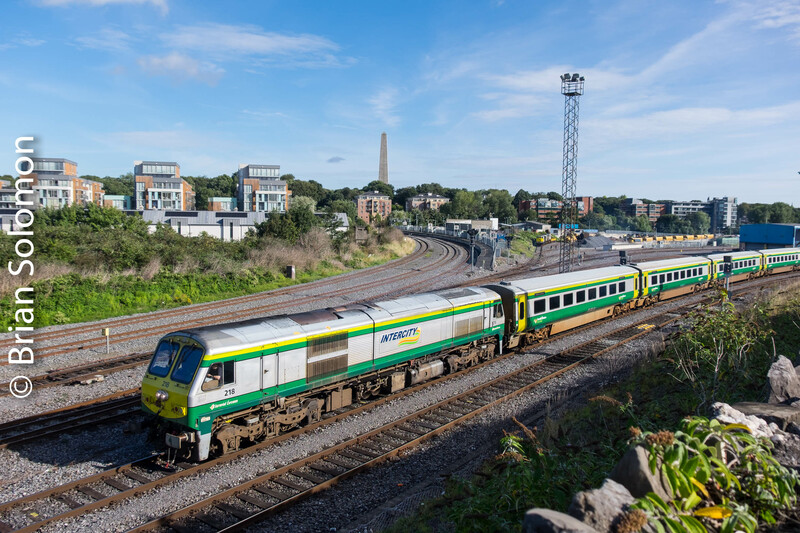 Class 201 Retrospective: Irish Rail 204 in four photos. Not as rare to my lens as 202, but not as common as say 201, 205, or the seeming omnipresent 215. Today, views of 204 on the move are still pretty neat since it’s been more than eight years since it turned a wheel. These are all Fujichrome photos, since I never photographed 204 at work using a digital camera. Maybe someday it will return to service. But even then I might take it on slide film for old time sake. 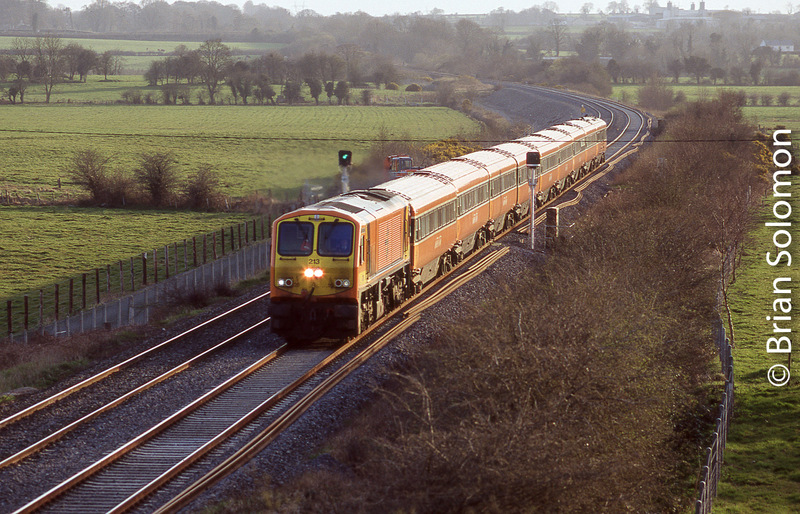 Irish Rail 204 races down road at Ballybrophy on 7 April 2007. 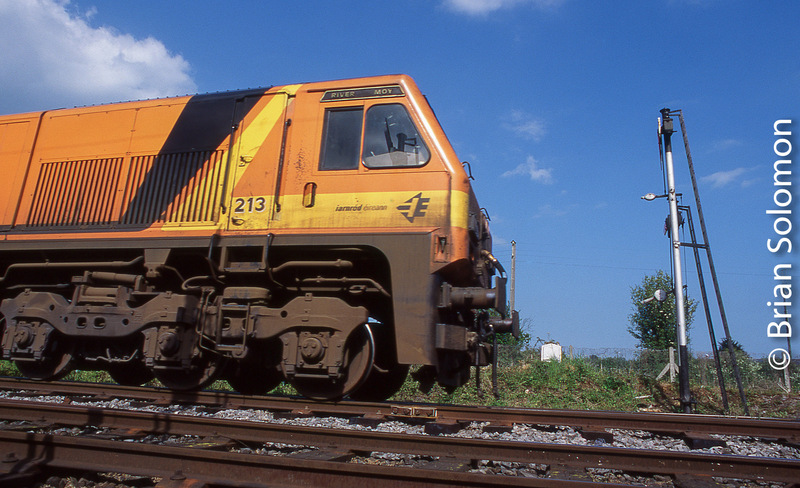 Nearly 12 years ago, freshly paint Irish Rail 204 passes Cherryville Junction. One for the bin? 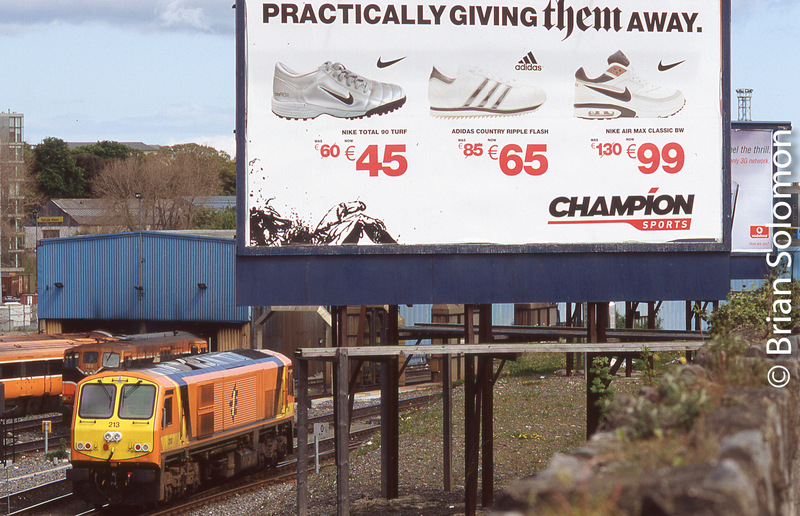 Here we have a fascinating photo of Irish Rail in transition; I exposed this view almost ten years ago to the day: March 2008. 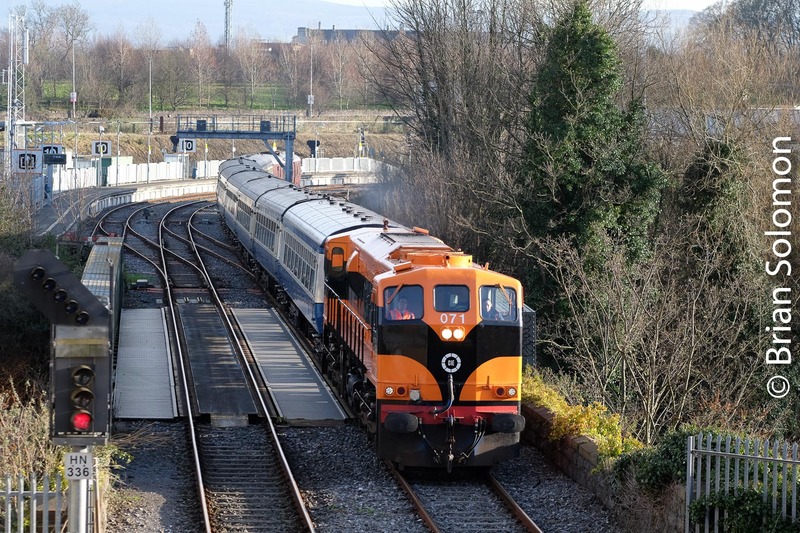 Locomotive 204 leads Mark 3s west at Islandbridge Junction as a new Mark 4 set rolls up-road; at left is a four-wheel ballast train led by a pair of Bo-Bos (class 141/181 General Motors diesels), with another Bo-Bo at right working as a station pilot. Look to the upper right in the yard and you’ll see a set of new Rotem ICRs. 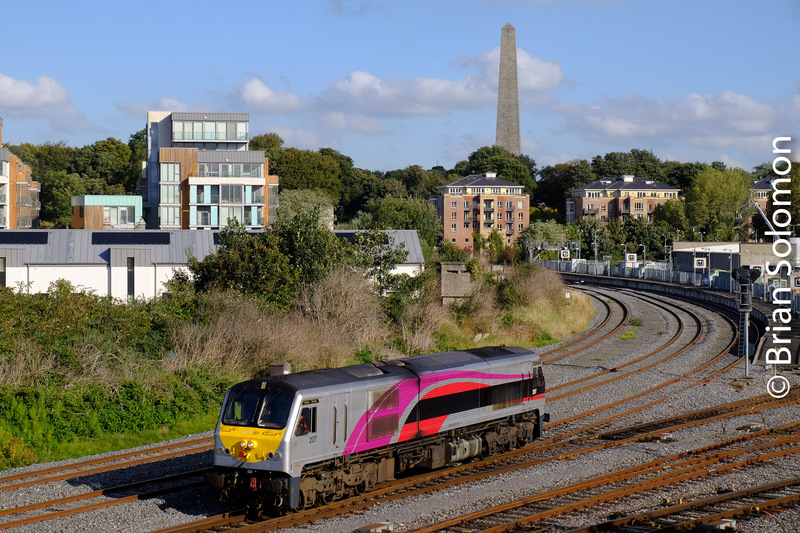 But this was bad photo: never mind all the railway action, I committed a compositional faux pas; I chopped the top of the Wellington Testimonial in the Phoenix Park! That’s it, pitch the photo! Nothing to see here! 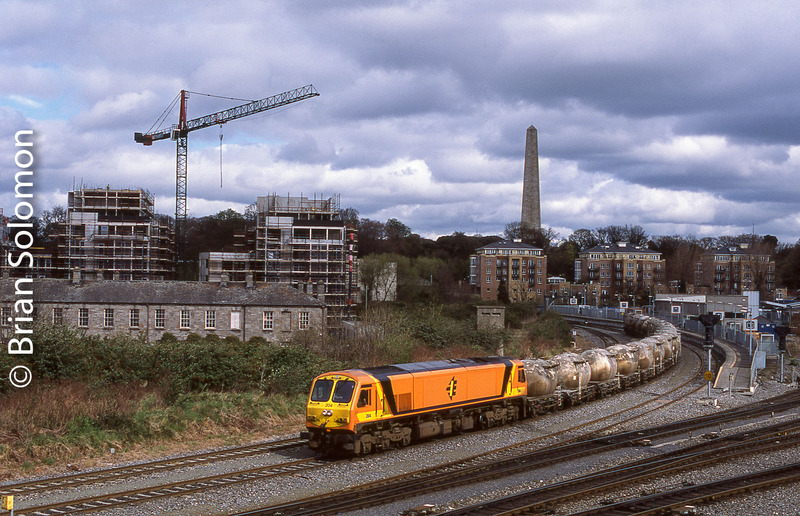 On another day, Irish Rail 204 leads the Platin-Tullamore cement. I was disappointed that an 071 didn’t work the train, but I’m sure glad I made this photo anyway! 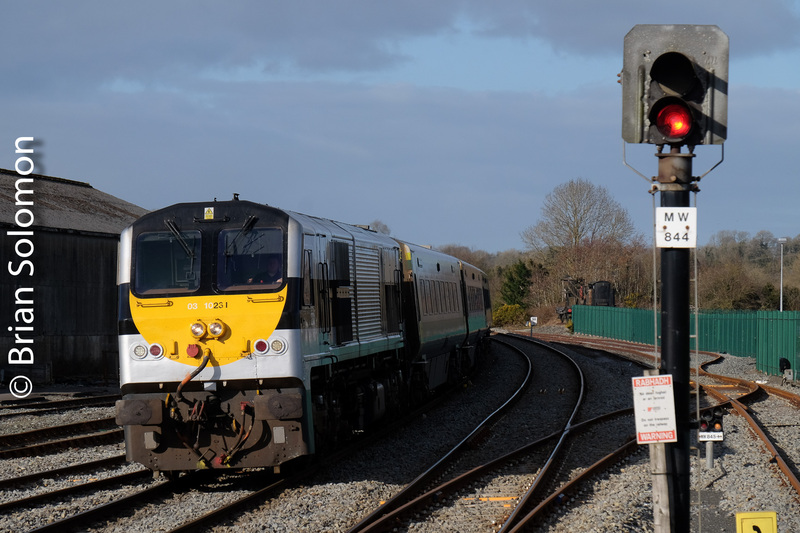 Up Close with Irish Rail 215 in Fresh Paint-Five New Photos. 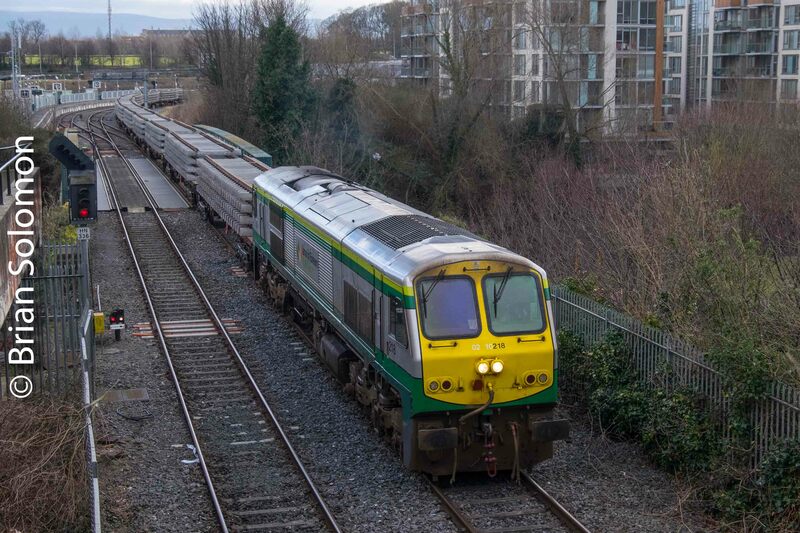 Irish Rail’s class 201 General Motors-built diesel-electric number 215 (now technically 92 60 02 10215-6) was recently repainted in fresh green and silver paint. Over the last few days I had several opportunities to photograph this locomotive up-close, allowing for some detailed images. Here’s a selection of Lumix LX7 views. 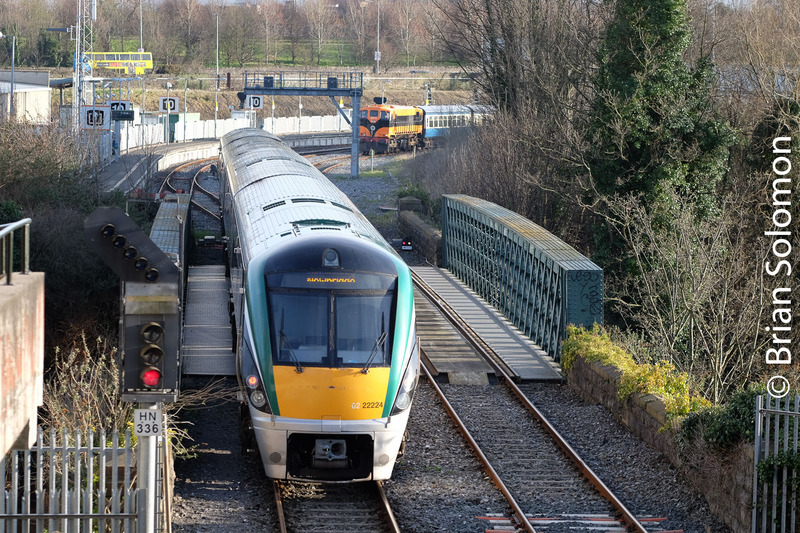 Irish Rail 215 works the back of a Mark 4 set on approach to Heuston Station Dublin. Irish Rail 215 at Dublin’s Heuston Station. Lumix LX7 digital photo. Irish Rail 215 at Kent Station, Cork. Lumix LX7 digital photo. Irish Rail 215 at Kent Station, Cork. Lumix LX7 digital photo. Contrast and saturation adjusted in post processing. Britain’s famed Settle & Carlisle is among the great railway lines. Its superb engineering and stunning natural settings, combined with a history of dramatic lighting effects as a result of the surrounding topography have long made this a popular setting for railway photographers. Many years ago I rode over the line on a trip from Haworth to Arnside via Carlisle, but until a couple of weeks ago, I’d never properly photographed the railway. My old buddy and fellow railroad photographer, TSH and I used a hired car to explore this fascinating section of railway line. We started near Garsdale and worked our way back toward Settle. A Leeds-bound class 158 DMU hums along the Settle & Carlisle towards Garsdale in August 2014. Canon EOS 7D photo, August 2014. Old station buildings at Dent on the Settle & Carlisle in August 2014. Canon EOS 7D with 200mm lens. As predicted, an EWS coal train led by a General Motors-built Class 66 diesel near Dent. Dappled sun illuminates the valley beyond. Canon EOS 7D with 100mm lens, August 2014. 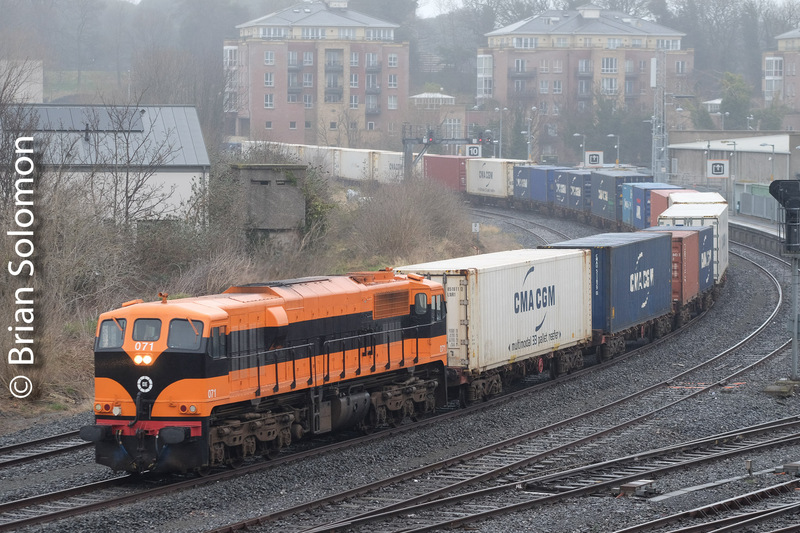 I’ve often heard that this line carried a bit of freight, and my investigations prior to arriving there indicated we should have seen about 6-7 freights during the course of the day. We saw one EWS coal train. That was all. Thankfully, the regular passenger service operated about every two hours, so at least there was some movement over the line. Bad luck, as they say. The scenery and engineering was sufficiently impressive to compensate for the comparative dearth of traffic and I made dozens of photographs using film and digital photography. A northward railcar works toward Dent. Canon EOS 7D. In the evening, a class 158 emu approaches its station stop at Ribblesdale. Canon EOS 7D with 200mm lens. Stay tuned for more S&C views tomorrow! Streamliners at Spencer: The Real Star of the Show? Although streamlined steam locomotive 611 was getting most of the attention, historically the most important exhibit was General Motors FT demonstrator 103. Last night FT 103 was lit up for all to see. General Motors model FT lit up at Spencer Shops on May 30, 2014. Exposed with a Canon EOS 7D with 100mm lens on a Gitzo carbon-fiber tripod. I’ve written about this locomotive in many of my books. It is the most influential American locomotive of the twentieth century because it demonstrated to the railroad industry that diesels offered a cost effective replacement for steam. Electro-Motive’s most significant innovation was its development of the first commercially viable road freight diesel. From a technical perspective this was an advancement of the E-unit — the application of this long anticipated new road diesel proved revolutionary for American railroads. Once on a roll, it not only turned locomotive building on its ear, but forever changed the way railroads bought locomotives and operated trains EMD’s F-unit was the most important player in the rapid dieselization American lines. NS CEO, Wick Moorman pointed out in yesterday’s address at Spencer, that FT 103 was ‘even older than 611,’ while sincerely thanking the St. Louis Museum of Transportation for sending the locomotive for display. Read more about General Motors streamlined diesels, check out my book Electro-Motive E and F Unit. Click here for more photos of the Steamliners at Spencer event. Morning Views, May 28, 2014—North Carolina Transportation Museum. With more than two dozen classic locomotives to photograph, and lots of other relics of interest, I exposed more than 300 image with the Lumix LX-7 in just three hours. In addition, I was also working with my Canons, one for film, one for pixels. General Motors classic FT—’the diesel that did it’. Alco PA builder’s plate. Is this the real thing or a replica? It’s not all about the locomotives, this fine old passenger car caught my eye. A bit of work on a Reading FP7A. My dad caught these on the ‘Crusader’ back in the day. Southern Railway: visions of yesterday and today. Spencer Shops was a Southern facility. The light was mixed. Nice soft early sun soon gave way to a hazy flat bright light. I’m glad I brought my old Minolta IV light meter, this proved very useful. The ease of use of the Lumix LX-7 made it an especially valuable too. Today I was working with the electronic view finder, instead of the rear screen display. I wonder if this altered my compositions? Drumhead on the Sandy Creek round-end observation car. Erie Railroad E8A 833—last of its kind. Nose view of General Motors FT 103. I’d argue that this was probably the most significant locomotive in the 20th Century. Read about it in my American Diesel Locomotive and EMD Locomotives. Books on the history of American diesels. I was very impressed by the paint on the Lackawanna F3’s, even if they were built for the Bangor & Aroostook, What are your favorite locomotives on display at Spencer? One of three DL&W painted F-units on display. Washing Pennsylvania Railroad E8A 5711 at Spencer. Perhaps someone else should fling some mud and grime to make things seem more authentic? More Spencer Streamliner photos to come over the next few days! Tracking the Light posts new material every day, with special ‘Extra’ posts on the Streamliners at Spencer event this week! DAILY POST: Revisiting Derby Curve. Photographing on the old Boston & Maine in the Snow. Pan Am Railways’ local freight ‘FI-1’ works west at Derby on its return to Fitchburg Yard. This is the approximate location of the photo in Ball’s book, but a bit higher. Canon EOS 7D with 100mm lens. A few weeks ago I called into Tucker’s Hobbies to visit with Rich Reed who was working the counter. I picked up a copy of Don Ball Jrs’ classic book Americas Railroads, The Second Generation. I remember finding a copy of Ball’s book at the Wilbraham Library when I was in Junior High School and being very impressed by the photographs and their arrangement. In October 1981, my parents drove me to Brattleboro, Vermont on a windy, rainy evening to watch a slide show that Ball was presenting. After the show, I spoke to him briefly. I met him once again, two years later on Steamtown’s Vermont final run from Bellows Falls to Rutland. Ball was running the operation at the time. This puzzled me. I’m usually very good with picking out specific locations. I have a memory for that sort thing . . . most of the time. Indeed we were, I remember! So then, on Thursday, December 19, 2013, Rich, Paul Goewey and I were back in that part of the world, and we went to the very spot where Don Ball made his photograph. That wasn’t really why we were there, but we were. The reason for our visit was that the lighting angle suited a westbound train. More to the point, Pan Am Railways’ POED (Portland to East Deerfield) freight had stalled about a mile to the west. A light engine had come out from Ayer and had tied onto the head-end to assist the train up to Gardner. 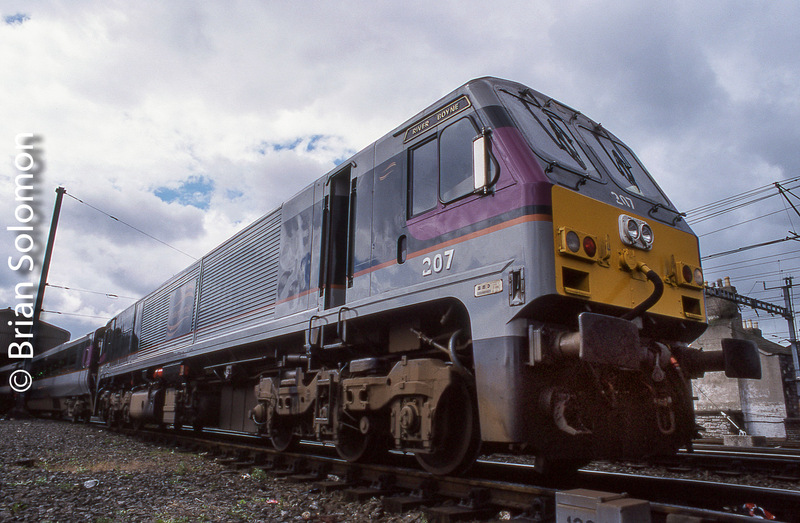 A Boston-bound MBTA train shoves eastward with the locomotive at the back. This is one of the old ‘screamers’ featured on Tracking the Light on December 21, 2013. Instead of standing precisely in Ball’s shoes, I scrambled up the side of the hill to get a slightly higher angle. We photographed the parade trains, including the struggling POED. Looking back at Ball’s photo, it is interesting to see how much the location had changed over the years. And the railroad too! Pan Am Railways was having a difficult time. POED with 102 cars and weighing 4,882 tons, had stalled climbing the hill west of Shirley when its lead locomotive suffered some electrical difficulties. To get the train moving, this Norfolk Southern GE DASH8-40C was sent from Ayer to assist. The train is on the move heading west at Derby Curve just after 1:34 in the afternoon. Canon EOS 7D with 100mm lens. Trailing view of Pan Am Railway’s POED. The failed locomotive is a former Southern Pacific SD45. I wonder, had I seen this locomotive on Donner Pass or climbing the Siskiyou Line? Anyone have a roster handy? Today its Pan Am 611, what was it back then? Ghost of the Balls in Bellow Falls. Twilight, apparently, may strictly defined by the specific position of the sun below the horizon. 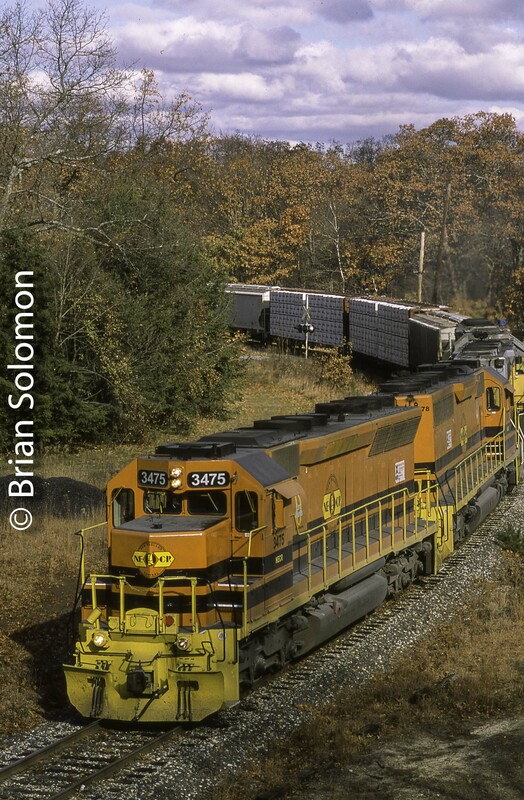 Anyway, it was the end of day’s photography in October 2004, when Tim Doherty and I visited Bellows Falls to witness the arrival of Guilford Rail System’s WJED (White River Junction-East Deerfield) freight. This train worked interchange from Vermont Rail System’s Green Mountain Railroad and I made a series of atmospheric images at the passenger station. In the lead was a former Norfolk Southern high-hood GP35, a rare-bird indeed. Bellows Falls is one of my favorite places to make railway images. I’ve been visiting as long as I can remember. My family had been taking day trips to Bellows Falls, and some of my earliest memories are of the tracks here. But, I’ve rarely made photos here at this time of day. Twilight? Dusk? Evening? How about: dark enough to warrant a tripod, but light enough to retain color in the sky? Guilford’s WJED eases past the Bellows Falls passenger station. Exposed using a Nikon N90S with Fujichrome. WJED shoves back on the interchange to collect cars from the Green Mountain Railroad. The Rutland had been gone more 40 years when I made these photos; more than 50 now. Which went first? The Rutland or the balls at Bellows Falls? Irish Rail Close-up and Real. Footbridge at Clonmel, County Tipperary on November 19, 2004. Exposed with a Nikon F3 on Fujichrome slide film. It would be something else if it were unreal, no? I’ve always liked to make macro views of railways. Examining the texture, colors, and shape of the equipment, track and structures allows for better appreciation of the subject. One of the best times to make close ups and detail photographs is under dramatic lighting; low sun or stormy light, where richer qualities make for more pleasing tones. Even the most mundane and ordinary subjects seem more interesting with great light. Yet, detailed views can also make use of dull days when by focusing on texture and using extreme focus can compensate for flat lighting. Irish Rail made for an especially good subject for detailed images, in part because there was so much antique equipment to photograph. Well-worn infrastructure is inherently fascinating. Here out in the open metal has been doing a job for decades and often it shows the scars from years of hard work, like an old weaver’s time weathered hands. 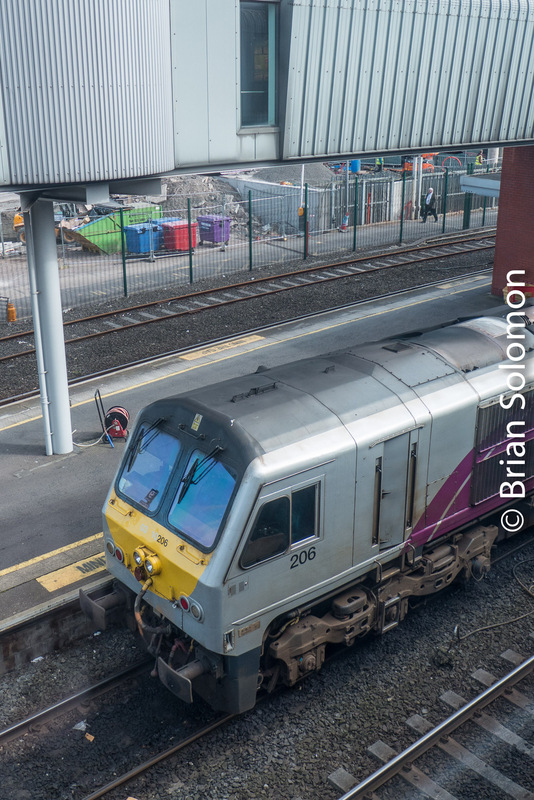 I’ve made hundreds of Irish Rail close-ups over the years. Here a just a few. Look around railways near you and see what you find! Sometimes the most interesting photographs can be made while waiting for trains. Signal cabin interior at Rathmore. I like lever 23 the most. Exposed with a Contax G2 fitted with a 16mm Hologon, focused manually. Crows congregate on the Carrick on Suir footbridge on December 11, 2004. I made this image with my Nikon F3 with a 180mm Nikkor telephoto while waiting for an empty sugar beet train. Do you think the crows care about blue NIR diesels? On Spring evening, Enfield cabin catches a fading wink of sunlight. 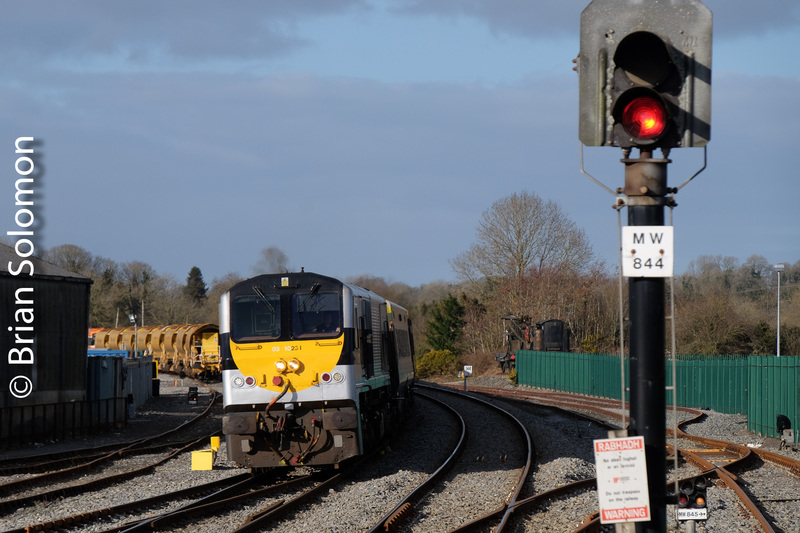 Irish Rail 175 basks in the November sunlight at Mallow, County Cork. Canon EOS 3 with 24-70mm zoom lens.